This article is about the children's musical group. For their self-titled debut album, see The Wiggles (album). The Wiggles are an Australian children's music group formed in Sydney, New South Wales, in 1991. Since 2013, the group members are Anthony Field, Lachlan Gillespie, Simon Pryce, and Emma Watkins. The original members were Field, Phillip Wilcher, Murray Cook, Greg Page, and Jeff Fatt. Wilcher left the group after their first album. Page retired in 2006 due to ill health and was replaced by understudy Sam Moran, but returned in 2012, replacing Moran. At the end of 2012, Page, Cook, and Fatt retired, and were replaced by Gillespie, Pryce, and Watkins. Cook and Fatt retained their shareholding in the group and all three continued to have input into its creative and production aspects. The Wiggles performing live in Sydney, 2018. Field and Fatt were members of the Australian pop band The Cockroaches in the 1980s, and Cook was a member of several bands before meeting Field and Page at Macquarie University, where they were studying to become pre-school teachers. In 1991, Field was inspired to create an album of children's music based upon concepts of early childhood education, and enlisted Cook, Page, and Fatt to assist him. They began touring to promote the album, and became so successful, they quit their teaching jobs to perform full-time. The group augmented their act with animal characters Dorothy the Dinosaur, Henry the Octopus, and Wags the Dog, as well as the character Captain Feathersword, played by Paul Paddick since 1993. They travelled with a small group of dancers, which later grew into a larger troupe. The group's DVDs, CDs, and television programs have been produced independently since their inception. Their high point came in the early 2000s, after they broke into the American market. The group was formally consolidated in 2005. They were listed at the top of Business Review Weekly's top-earning Australian entertainers four years in a row, and earned A$45 million in 2009. In 2011, the worldwide recession hit The Wiggles, as it had done for many Australian entertainers; they earned $28 million, but they still appeared second on BRW's list that year. The Wiggles have enjoyed almost universal approval throughout their history, and their music has been played in pre-schools all over the world. They have earned several Platinum, Double Platinum and Multi-Platinum records, as well as sold 23 million DVDs and 7 million CDs, and have performed, on average, to one million people per year. The group has also earned multiple Australasian Performing Rights Association (APRA) and Australian Recording Industry Association (ARIA) Music Awards. The group received songwriting help from John Field, Anthony's brother and former bandmate, and from Phillip Wilcher, who was working with the early childhood music program at Macquarie. [note 3] After contributing to their first album, hosting the group's first recording sessions in his Sydney home, and appearing in a couple of the group's first videos, Wilcher left the group and went into classical music. [note 4] The group reworked a few Cockroaches tunes to better fit the genre of children's music; for example, The Cockroaches song "Hot Tamale", written by John Field, was changed to "Hot Potato". Anthony Field gave copies of their album to his young students to test out the effect of the group's music on children; one mother returned it the next day because her child would not stop listening to it. First recorded in 1991 on The Wiggles' first album, this was originally a Cockroaches tune changed slightly to fit the genre of children's music. "Do the Monkey", recorded by The Cockroaches in 1989. With very little changes, it is almost the same as The Wiggles' version, showing how The Wiggles revamped many songs in The Cockroaches' library. To promote their first album, The Wiggles filmed two music videos with the Australian Broadcasting Corporation (ABC) and created a self-produced, forty-minute-long video version. Finances were limited, so there was no post-production editing of the video project. They used Field's nieces and nephews as additional cast, and hired the band's girlfriends to perform in character costumes. Cook's wife made their first costumes. They used two cameras and visually checked the performance of each song; that way, according to Paul Field, it took them less time to complete a forty-minute video than it took other production companies to complete a three-minute music video. The Cockroaches' former manager, Jeremy Fabinyi, became the group's first manager. Using their previous connections, he negotiated with the ABC to air their TV show and to help them promote their first recording. The album cost approximately A$4,000 to produce and it sold 100,000 copies in 1991. Field and Cook got teaching jobs, while Page finished his degree, so they could only perform during school holidays; finding time to do so was, as Field reported, "challenging". Fabinyi advised them to tour in unusual settings throughout Sydney and New South Wales. The Wiggles' debut performance was at a friend's daycare facility in Randwick, for about a dozen children. They played for crowds at shopping centres like Westfield in Sydney and at small pre-school events and parties, and busked at Circular Quay, then moved on to regional tours and shows for playgroup associations, averaging about 300 people in the audience. They were promoted by local playgroups or nursing mothers' associations with whom they split their proceeds. They performed at pre-schools with other ABC children's performers; when 500 people attended these concerts just to see The Wiggles, they started doing their own shows, and according to Field, "Suddenly people started rolling up to performances in astonishing numbers". After the production of their second album, The Wiggles, who were called by their first names when they performed, began to wear costumes on stage as Fabinyi suggested and as The Cockroaches had done, and adopted colour-coded shirts: Greg in yellow, Murray in red, Jeff in purple, and Anthony in blue. The coloured shirts also made it easier for their young audience to identify them. As Field reported, the decision to emphasise colour was "a no-brainer, considering our pre-school-age audience". Cook and Fatt already owned shirts in their colours, but Field and Page "met in a Sydney department store and literally raced to see who got the blue shirt". Another early development used throughout the group's history was their signature finger-wagging move, which was created by Cook after seeing professional bowlers do it on television. They used the move when being photographed with children because it was their policy that touching children, no matter how innocently, was inappropriate. It also protected them from possible litigation; as Paddick has explained, "There is no doubting where their hands are". Through the rest of the 1990s, The Wiggles maintained a busy recording and touring schedule, becoming as Field reported and despite his strong dislike of touring, "the hardest-working touring act in the country". They released multiple albums and home videos and, depending upon the word of mouth of their audience, performed to increasingly large audiences in Australia and New Zealand despite having to re-introduce themselves to a new audience of children every three years. They produced a new album and video each year and toured to promote them. By late 1993, they "grew bigger than anyone had thought", and hundreds attended their concerts; by 1995 they had set records for music and video sales. In 1997, Twentieth Century Fox produced a feature-length film, The Wiggles Movie, which became the fifth-highest grossing Australian film of 1998, earning over a million-and-a-half dollars. In spite of their early success in Australia, Paul Field reported that the band was unable to produce a television program on the ABC, where they felt they would receive the most exposure to the pre-school market. "Around 1996–1997", they filmed a television pilot for the ABC, but as The Sydney Morning Herald reported in 2002, "the project never got off the ground due to irreconcilable artistic differences". As a result, The Wiggles financed a TV program of 13 episodes themselves and sold it to the Disney Channel in Australia and to Channel Seven, where it became a hit. By 1998, The Wiggles were ready to move on to international markets, despite its members' health issues, especially Field's. The reaction of producers in the UK was less positive than the group would have liked, although they were eventually able to make inroads there, but their real success came in the US. [note 7] Disney arranged for them to perform at Disneyland in California, where they were discovered by Lyrick Studios, the producers of Barney & Friends. Both Anthony and Paul Field reported that Lyrick, despite their initial misgivings about whether American audiences would accept the band's Australian accents, came to understand The Wiggles and their goals, and after successful tests with American children, enthusiastically promoted them. The Wiggles used many of the same promotion techniques in the US that they had used in Australia, and chose to keep their concerts simple and maintain the same values that were successful in Australia. The Wiggles performed during the intermission of Barney Live stage shows, which The New York Times likened to "getting the warm-up slot for the Stones" in the pre-school entertainment world. [note 8] In 2000, when video sales took off in the US, Lyrick began to distribute Wiggles videos and advertised them by including Wiggles shorts as trailers in their Barney videos, which, as Anthony Field stated, "pushed us over the edge". At first, the group's videos were distributed in boutique stores such as FAO Schwarz and Zany Brainy, and on-line. According to Paul Field, they entered the mass media market when their videos became top-sellers at Amazon.com, and their first two videos, Yummy Yummy and Wiggle Time, landed in the top ten at Amazon.com. Stores such as Wal-Mart began to take notice, and began to sell Wiggles videos. The band released nine DVDs in the next three years to keep up with the demand. As they had done in Australia, The Wiggles chose to tour, but start off small, with simple props and sets instead of hiring a touring company. Some of their first appearances in America were at Blockbuster Video parking lots to small audiences—as Fatt said, "a dozen people". They performed at small venues such as church halls and 500-seat theatres in Brooklyn and New Jersey, and upgraded to larger venues as ticket sales increased. Anthony Field reported that one week they would perform to 8,000 in Sydney and to 20 people the following week at a parking lot in a small town in the US. One time, they performed for a dozen people at the Mall of America in Minnesota, but half of the audience were hired by Lyrick. Eventually, they moved to larger arenas such as the Beacon Theatre and Madison Square Garden. They performed at SeaWorld in Orlando, Florida, for six weeks. Their audiences began to increase, and they toured Australia, New Zealand, Hong Kong, the US, and the UK. The Wiggles' popularity in the US increased "in the shell-shocked weeks after the terrorist attacks on New York City in 2001", when the group performed there, even when other acts cancelled their tours, a decision that earned them loyalty and respect. According to Cook, the press proclaimed that they were braver than many Australian sports teams that had cancelled their appearances. Paul Field stated, "New York has really embraced them. It was a kind of watershed." [note 9] Strong sales of The Wiggles videos eventually caught the attention of the Disney Channel in the US, who was impressed by their "strong pro-social message". In January 2002, Disney began showing Wiggles video clips between their programs. By June of that year, the popularity of the clips prompted the Disney Channel to add both seasons of "The Wiggles" series to their schedule and showed full episodes multiple times per day. Field reported that despite their "modest production values", the shows were popular with pre-schoolers. Beginning in 2002, The Wiggles filmed four seasons' worth of shows exclusively with the ABC. The network called them "the most successful property that the ABC has represented in the pre-school genre". By the end of 2002, according to Field, "we knew we were involved in something extraordinary in the US". Their concert schedule in North America doubled, seemingly overnight; they began performing up to 520 shows per year all over the world. [note 10] They also began to produce other stage shows in places The Wiggles themselves were unable to visit, in Australia, the UK, and US, that featured their characters, a host, and a few dancers. [note 11] The Age called this time period (about the mid-2000s) the group's "high point"; they earned A$45 million a year in revenues, and had several licensing deals and an international distribution agreement with Disney. Despite their success, founding member Anthony Field almost left the group in 2004, shortly after his marriage and the birth of his first child, due to his serious medical issues, which were worsened by The Wiggles' demanding tour schedule. After meeting chiropractor James Stoxen in Chicago, Field improved his health to the point that he was able to continue. He began to hire teams of chiropractors for himself, his fellow bandmembers, and castmembers in every city they performed, which he credited with making it possible for them to fulfill their touring requirements. In December 2005, lead singer and founding member Page, at age 33, underwent a double hernia operation. He withdrew from The Wiggles' US tour in August 2006, after suffering fainting spells, lethargy, nausea, and loss of balance. He returned to Australia, where doctors diagnosed his condition as orthostatic intolerance, a chronic but not life-threatening condition. [note 12] Page's final performance with The Wiggles was in Kingston, Rhode Island. On 30 November 2006, the Wiggles announced Page's retirement from the group. "I'll miss being a part of The Wiggles very much, but this is the right decision because it will allow me to focus on managing my health", Page said in a video message, which The Sydney Morning Herald called "unsettling", posted on the group's web page. Page was replaced by Sam Moran, who had served as an understudy for The Wiggles for five years and had already stood in for Page for 150 shows. Initially, The Wiggles struggled over their decision to replace Page, but after their audience's positive response to Moran, they decided to continue as a group because they thought that was what their young audience would want. According to Fatt, who called it "a huge decision" and "a teachable moment" for them, they chose to be honest with their young audience as they made the transition from Page to Moran. As part owner of The Wiggles, Page received a payout of about $20 million. Although Moran's transition as The Wiggles' lead singer was "smooth" for the young children of their audience, it was more difficult for their parents. Moran said that "most children understood". Field reported that by the group's 20th anniversary in 2011, due to the ever-changing nature of their audience, most of their young fans were unfamiliar with Page. Cook stated that Moran's transition was challenging for the group because since he replaced their lead singer, it changed their sound. Fatt characterised Moran's singing style as more operatic, so they chose different keys to sing and perform. The Wiggles never publicly disclosed how much Moran was paid, but it was reported that he earned $200,000 per year. Moran was featured in his first DVD and CD as a member of the group in early 2008, and a sixth season of The Wiggles' television series featuring Moran was filmed and began airing in Australia. At the end of 2007, The Wiggles donated their complete back catalogue of 27 master tapes to Australia's National Film and Sound Archive. Their business ventures during these years included opening up "Wiggles World" sections in theme parks in North America and the Arab World, internet offerings, the creation of new television shows, and a five-year-long partnership with the digital cable channel Sprout in 2009. In December 2010, Cinemalive beamed a Wiggles concert live from Acer Arena into movie theatres all over Australia, for children and their families unable to attend their shows. In early July 2011, founding member Fatt developed arrhythmia and underwent "urgent but routine" heart surgery, when he was fitted with a pacemaker after feeling unwell for several weeks and blacking out. He missed the group's US tour as a result, after not missing a show in 20 years. Also in mid-2011, The Wiggles celebrated their 20th anniversary with circus-themed shows and performances throughout Australia and the outback in a circus tent, as well as a "physically grueling" birthday-themed tour of 90 shows throughout Australia, which Paul Field called "one of the biggest of their careers". Sydney's Powerhouse Museum commemorated the group's anniversary with an exhibit that displayed Wiggles memorabilia. In 2011, the worldwide financial crisis hit the group, and they recorded their first drop in revenues in 10 years, at approximately $2.5 million, a total decrease of 28 percent. Royalties partially offset the difference between their 2010 and 2011 revenues. Their managing director Mike Conway called 2011 their toughest year financially. For the first time, they had negative equity, with more liabilities than assets, and the owners had to provide the funds for them to continue operations. Conway stated that their losses were due to less touring time in the US, difficulties in placing their DVDs in Walmart, and their required investment in a new digital platform. In January 2012, and amidst a great deal of controversy, The Wiggles announced that Page had regained his health and was returning to The Wiggles. He returned as an employee "exactly on the same level as Sam", rather than a co-owner, having relinquished his business interest in the group after he left in 2006. According to The Sydney Morning Herald, interest in Page's return was sparked when they met during the group's induction in the ARIA Hall of Fame in November 2011. After it was decided that Moran would no longer continue on as the Yellow Wiggle, the group asked Page to return, only until August 2012, "to help transition from Sam [Moran] to a new Yellow Wiggle." Business Review Weekly reported that the presentation of Moran's departure had been mishandled and had potentially damaged their brand image. Paul Field agreed, stating that they "could have handled the communication and management of the transition better". Cook later admitted that they were shocked by the backlash in the press and among the parents of their audience. As part of his severance package, Moran continued to collect song royalties and was granted use of The Wiggles' studios. In mid-2012, The Wiggles announced that Page, Fatt, and Cook would be retiring from touring with the group; Emma Watkins, the first female member of The Wiggles, replaced Page, Lachlan Gillespie replaced Fatt, and Simon Pryce, who was initially supposed to replace Page in August, replaced Cook. 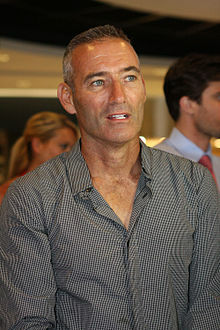 Anthony Field remained in the group because he found it too difficult to give up and because he still had a passion for educating children. According to Paul Field, his brother staying in the band "was a vital decision to placate American, British and Canadian business partners". Page, Fatt, and Cook remained involved with the creative and production aspects of the group. Fatt and Cook had been talking about quitting touring for many years; Cook announced his intention to retire first, citing a desire to spend more time with his family, and then Fatt announced his own retirement shortly thereafter. Page, who was still struggling with his health issues and had stated that his interest was in working with the group's original line-up, was subsequently asked to extend his stay until the end of the year so he would leave alongside Cook and Fatt, to which he agreed. Cook reported that the original members were confident that the new group would be accepted by the fans because they passed on their founding concepts of early childhood education to Watkins, Gillespie, and Pryce. The new members, like Moran, who was not approached to return, were salaried employees. The group, for their farewell tour, visited 8 countries and 141 cities, for a total of almost 250 shows in over 200 days for 640,000 people. Watkins, Gillespie, and Pryce wore "In Training" T-shirts, and debuted the song "Do the Propeller!" during these concerts. The final televised performance of the original band members, along with the new members, was on 22 December 2012, during the annual Carols in the Domain in Sydney. Their final performance, after over 7000 shows over the years, was on 23 December at the Sydney Entertainment Centre. Also by 2012, The Wiggles performed to audiences whose parents attended their shows in their early years, and they were hiring performers who were part of their audience as young children. [note 13] The Wiggles began airing a show on Sirius XM satellite radio in late 2012, featuring the original members and their replacements, and stories and games for young listeners. In December, the group auctioned their famous "Big Red Car" (called the "iconic Volkswagen Beetle Cabriolet") for charity for almost A$36,000 on the auction site eBay. The money was donated to the Melbourne-based charity SIDS and Kids. The new iteration of The Wiggles, with Field and its new members, began touring in early 2013. Cook became the group's road manager in mid-2013. Pryce reported that since The Wiggles' audience changed every few years, the transition to the new group was easier for their young audience than it was for their parents. One of their challenges, especially for their early tours, was learning The Wiggles' catalogue of 1400 songs. In early 2016, Pryce described The Wiggles' competitive culture of fitness, especially among the male cast, by citing the group's grueling performance schedule, saying, "Sometimes it feels like it's an extreme sport". After a seven-year absence from Australian television, they filmed a new show, called Ready, Steady, Wiggle, filmed in their spare time at their studio in Sydney between tours and on the road. Watkins, who had a film-making degree, played an important role in its production. The series was picked up by the on-line streaming service Hulu in 2015. Anthony Field admitted that they found it "hard going" until they returned to television. Merchandise featuring the original group outsold the new group's products, and they failed to sell-out their concerts. By 2015, Paul Field called the new group "an amazing success". By that time, they had produced 8 CDs and DVDs, and 3 new television series. Field reported that the new group went through the same process as the original group in terms of audience acceptance and "benchmarks of success". They performed to sell-out audiences throughout Australia, had high sales of their DVDs and CDs, and won an ARIA in 2014. According to Kathy McCabe of News Corp Australia, it took 18 months for the new group to be accepted by their audience. McCabe credited their success to Watkins, who became the group's stand-out member. According to Field, an American journalist called her young fans, who came to concerts dressed in yellow and wearing bows like her, the "mini Emma army". She was so popular, she starred in her own TV show, called "Emma", without the other Wiggles, in 2015. Field called her "an aspirational role model" for their young audience and reported that she had increased their fan base of girls. Field stated that the audience emulated her fashion choices, opening up new merchandising possibilities for the group. In 2014, The Wiggles doubled their ticket sales from the year before and played in sold-out venues all over Australia and the world for 250,000 fans. Hyde Park in Sydney had to be closed on Australia Day because fans filled it to see the group perform. They continued to sell-out concerts throughout 2015. Also in 2015, the group produced their DVD, Rock and Roll Preschool, featuring musician David Campbell, and it was announced that The Wiggles would produce their second feature film; comedian Ben Elton was slated to write the script and co-write the soundtrack. In early 2015, Gillespie and Watkins revealed that they had been dating for two years; they announced their engagement in May 2015. They were married on 9 April 2016 at Hopewood House in Bowral in New South Wales, Australia. In August 2018, Gillespie and Watkins announced their separation. The Wiggles celebrated their 25th anniversary with a performance by the new members, published as a free podcast on iTunes, in front of the Apple Store in Sydney in January 2016. In February, the original group members were to perform a charity concert for their fans over the age of 18, who were part of their first audiences, at the Dee Why RSL club in Sydney. A new television series, called Wiggle Wiggle Wiggle, premiered on Treehouse in Canada in September 2017 and on Universal Kids in the US in October 2017. Based on a segment from the series, a new range of nursery items was launched in January 2019, catering for babies and toddlers under the new "Little Wiggles" branding. The Wiggles have written new music each year since their inception; they sequestered themselves for a month each summer and wrote three albums' worth of original children's music based on simple concepts familiar to young children, and using several genres of music and types of instruments. Most of their songs were short and started with the chorus because they felt that young children needed to be presented with a song's topic in their first few lines. They wrote songs individually at first, but eventually wrote as a group, often with John Field, trumpet player Dominic Lindsay, and Paddick. Fatt, the only member of the original group without a degree in early childhood education, tended to focus on composing music. Fatt told reporter Brian McElhiney, who called the group's songwriting process "a collaborate affair", that they wrote repetitive pop songs or jingles, which were appealing to children. Watkins reported that she was invited to write songs for their albums, even though she was primarily a dancer. John Fogerty of Creedence Clearwater Revival, who appeared in a Wiggles video in 2002, told The New York Times that he was "very impressed" with the group's songwriting, especially with their drum sound. According to Field, the transition from writing music for an adult rock band to writing children's music was not a big one for The Wiggles. "The Wiggles music isn't all that far removed from what we did in The Cockroaches, just a different subject matter", Field stated. "The Cockroaches sing about girls and love and stuff like that; The Wiggles sing about hot potatoes and cold spaghetti." Moran stated that The Wiggles wrote songs they liked and would listen to, and then made them appropriate for children. They approached simple and relocatable topics, such as food and nutrition, as teachers would in a pre-school setting, with simple melodies that were easy for children to sing and remember. The group sang the same 60s-style pop as The Cockroaches, but with different lyrics, although they were not confined to songs about love and could write about anything that interested and excited young children, which was limitless. The music they chose to write and perform was influenced by nursery rhymes, folk music, and rock songs of the 1950s and 1960s. Page reported, "First and foremost, we're entertainers". The Wiggles captured the interest of children by first entertaining them, and then by presenting them with educational messages. The group wrote and performed children's music that was different from what had been done previously; as Cook stated, "we didn't just go down the route of what people think is kids' music". They were not tied to one style or genre of music and often experimented in the studio; while some of their recordings were orchestral, others had a more live feel. The group was aware that their songs were often children's first exposure to music. Guitar Magazine speculated that since Cook was one of the first guitarists children were exposed to, he may be the most influential guitarist in the world. Cook was conscious that he was probably the first guitarist children would see, and said, "I always think that if it inspires kids to play guitar later on that would be great. I think it would be really nice if in 15 years I read that somebody got into guitar playing because of [The] Wiggles". In 2013, after Cook retired from touring with the group and became their touring manager, he reported that newer bands like Regular John approached him and said that The Wiggles were the first band "they got into". "Where was the fun? Where were the references to the simple things that are so dominant in a child's life? Favourite books, colours, dancing, playing, nap time. And what's wrong with kids getting up and grooving; squealing, screaming, and laughing through a performance? I wanted to explore alternate ways to write and perform for young children, to ensure the music was for them, not just the musician. Nothing complicated, snide, or condescending." The Wiggles' songwriting and performances were rooted in their professional training as pre-school teachers and in the concepts of early childhood education. Anthony Field reported, as he studied music for young children at university, being "shocked ... at the non-inclusive way music for children was usually performed". According to Field, children had to sit silently as musicians played "traditional songs often featuring negative or outdated lyrics and dealing with subject matter of no interest to small children". The lack of songs with themes and topics that interested children inspired Field to record The Wiggles' first album. The group's "golden rule", according to Field, was to make the content of their songs and shows "developmentally appropriate and fun". Their music, stage shows, and television and DVD productions were developed, as The New York Times reported, "from the premise that a young child has a short attention span, is curious about a limited number of objects and activities, loves having a job to do and is thrilled by mastering basic movements". They also respected their audience's intelligence and insight about entertainment, information, and honesty. As Field said, "Young children identify with relevant concepts, and enjoy being entertained and being part of the entertainment. They are willing to commit to interacting if you are direct, inclusive, and positive". The group understood that challenging young children to engage in difficult tasks is more effective than simply telling them to do it. They believed that young children were egocentric, so they stared continually into the camera in their videos and TV shows, and explained every action because they believed that young children needed to be told what to expect so that they do not feel left out and in order to feel safe. "We have a license to be silly, and a lot of what we do is about joy." The Wiggles' stage shows were full of action and audience participation. By the group's "New Wiggles" iteration, The Sydney Morning Herald called their shows slick and fast-paced, with inside jokes for the adult members of their audience. The bandmembers tended to wander throughout the audience, "thrilling toddlers and smartphone wielding guardians alike". Pryce, as an experienced stage performer, was conscious that their shows were the first live theater young children experienced; as a result, the group adapted the content of their shows to accommodate their audience's development and understanding. Paddick's role as Captain Feathersword became more important in the mid-1990s, especially in the group's stage shows, when he was able to incorporate his circus and opera training, as well as impersonations that were popular with their audience's parents. They believed in empowering children by practices such as greeting their audience members with "Hello, everyone", instead of "Hello, boys and girls" because as Paul Field has explained, the second greeting "unnecessarily separates children and has undertones of condescension". Kathleen Warren, the group's former professor at Macquarie University, believed that the group's practice of asking their audience to "Wake Up Jeff" when Fatt pretended to fall asleep was "very much in keeping with the way they work with children". [note 15] Warren stated that asking children to interrupt Fatt's slumber helped them build confidence and to feel more in control of their lives. Fatt was the only original member of The Wiggles without a background in early childhood education; he explained that was the reason falling asleep was chosen as his gimmick and that "it was a way of getting me involved in the shows without actually having to do anything". Paul Field reported that children in The Wiggles' audience felt "great excitement" and were disappointed if not given the opportunity to help Jeff in this way. Anthony Field, who called it "a simple audience participation and interaction gag we've done since the start of the group", claimed that it endeared Fatt to their audiences. The group's members took turns falling asleep in the early days of the group, but it became Fatt's gimmick because "it was a perfect fit". When Fatt retired, Gillespie took over the task of falling asleep. Simple movements were developed by their choreographers, including Leeanne Ashley, to accompany each song because, as The New York Times reported, they believed "in the power of basic movements to enchant young children". According to reporter Anders Wright, they intentionally made mistakes in their dance moves in order to identify more with their young audience. The group incorporated more dancing into their performances after the birth of Field's oldest daughter in 2004. "So [The] Wiggles have kind of become a bit more, dare I say, girly. Dorothy (the Dinosaur) does ballet now and we dance as well a lot more than we did", Field reported. In later years, corresponding with Field's developing interests in acrobatics and gymnastics, they added these elements to their stage shows, including, as Field reported, hiring several world-class athletes such as former trampoline champion Karl Shore. Watkins, whom Paul Field called "a dancer of many disciplines", was initially hired as a member of their troupe and referred to herself as "mainly a dancer". Between 1999 and 2003, to test the group's appeal across cultures, Warren used one of The Wiggles' CDs as an educational tool in a village near Madang, on the north coast of Papua New Guinea. She found that the Madangese children were able to relate to the group's songs, and that they were able to sing along and participate in their simple choreography. Although The Wiggles' recorded and performed songs, dances, and musical styles from different cultures and languages, The Wiggles did not find that adapting their music to non-Australian cultures was necessary to reach children in other countries. As Cook stated, "... Toddlers don't have the same hang ups as adults". The Wiggles recognised that as long as they spoke at the same level as their audience, their Australian accents would not matter, and that young children were able to adapt to a variety of contexts and to different pronunciations of common words, no matter where they resided. Anthony Field (in 2012). Field was instrumental in developing The Wiggles' business model. Despite Anthony Field's expressed dislike of the term, preferring to refer to it as "preserving the good name of The Wiggles", the group has stressed the importance of their brand and were protective of it. They remained as independent as possible, and retained full creative control and ownership of every aspect of their business. As Field stated, The Wiggles Pty Ltd was "not your regular 'corporate culture'". They made decisions by consensus and made business decisions based upon their experience as performers and their knowledge of early childhood education. They made careful decisions regarding their endorsements of toys and other products, and avoided over-extending their brand by only licensing products that correlated with their image. They had high expectations regarding the behaviour and attitude of everyone associated with the group. The Wiggles became formally consolidated in 2005. The group's board of directors consisted of the original three members, Paul Field, who has been general manager of operations since the group was formed and their manager since the mid-1990s, and Mike Conway, who had worked for Ernst & Young in England and become their general manager in 2001. In 2009, the Australian rock band AC/DC knocked The Wiggles, who earned A$45 million, from the top of Business Review Weekly's (BRW) list of top entertainment earners for the first time in four years. In 2011, the worldwide recession hit The Wiggles, as it had done for many Australian entertainers; they earned A$28 million, but they still appeared second on the BRW's list that year. By 2012, founding members Anthony Field, Cook, and Fatt retained 30% ownership of their brand, and Paul Field and Conway each owned 5%. It was reported that as part owner of The Wiggles, Page was given a A$20 million payout when he left the group in 2006. Other ventures of The Wiggles Pty Ltd included franchising their concept to South America, Taiwan, and other countries, opening "Wiggles World" sections in theme parks, and online offerings. The Wiggles enjoyed "almost universal approval" throughout their history. Their songs were sung and played in pre-schools all around the world. Between 2000 and 2010, The Wiggles earned 21 Gold records. According to a 2012 news release published to announce the retirement of Cook, Fatt, and Page, they earned several Platinum, Double Platinum and Multi-Platinum records, as well as sold 23 million DVDs and 7 million CDs. They performed, on average, to one million people per year. After 2003, front-row tickets to their sold-out concerts in the US were scalped for US$500. The group responded by reducing the number of seats sold per transaction, in order to keep prices down and avoid further tickets scalping. In 2008, the group found themselves in the midst of what The Daily Telegraph called a "ticketing scandal"; scalpers tried to sell a A$19 ticket on eBay for almost A$2,000 and a set of three tickets for A$315 for concerts in Melbourne, and a group of three tickets to a Wiggles UNICEF charity concert in Sydney had a price tag of A$510. The tickets were taken off eBay and voided. In what Paul Field called "one of the highlights of their 15 years of being together", The Wiggles were awarded an honorary doctorate degree from Australian Catholic University in 2006. Cook gave an address during the private ceremony honouring them. They were awarded another honorary doctoral degree in 2009 from their alma mater, Macquarie University. The group was named UNICEF goodwill ambassadors in 2008; they held a special concert to raise money for the organisation. In 2010, the four original members of The Wiggles were appointed Members of the Order of Australia for their service to the arts in Australia, especially children's entertainment, and for their contributions and support of several charities. They called the honour their "biggest recognition yet". The group has always invited children with special needs and their families to pre-concert "meet and greet" sessions. According to Fatt, many parents of these children have reported that The Wiggles' music has enhanced their lives, and that children with autism "respond to [The] Wiggles and nothing else". The Wiggles, throughout their history, have visited and performed for patients at the Sydney Children's Hospital every Christmas morning. In 2011, ABC Music released an album titled Rewiggled: A Tribute to The Wiggles to celebrate the group's 20th anniversary. The album features covers of many favourite Wiggles songs performed by notable Australian music artists. The APRA Music Awards are award ceremonies that recognise songwriting skills, sales, and airplay performance by its members annually. The Wiggles have won five APRAs and was nominated for another. In 2007, the group's members, along with John Field, were awarded APRA's International Achievement Award. The Australian Recording Industry Association Music Awards is an annual series of awards nights celebrating the Australian music industry, put on by the Australian Recording Industry Association (ARIA). The Wiggles have been nominated for Best Children's Album 24 times, and have won the award 14 times. In 2003, the group was awarded ARIA's Award for Outstanding Achievement, and in 2011, they were inducted into ARIA's Hall of Fame. ^ Field admitted that one of the things that drew him to teaching was that women outnumbered the men at Macquarie's program. ^ According to Field, the four original members of The Wiggles, with Page's "mellifluous voice" and "perfect children's music instrument", Cook's knowledge of child development, Fatt's "incredible musicianship and gentle persona" that appealed to children, and Field's energy, balanced each other. ^ Field called Wilcher "a talented musician and composer". ^ In 2003, Wilcher claimed that his involvement with The Wiggles had been "virtually erased"; in the late 1990s, they re-recorded their first CD, renamed it, and removed all of Wilcher's compositions. ^ According to Anthony Field, his brother John enjoyed the group's busking performances, but found their pre-school gigs "weird", choosing to contribute by writing and changing The Cockroaches' songs to children's songs. ^ By 2006, they toured with two 54-foot trucks that carried equipment and merchandise and three buses that carried 33 cast members, and would employ 25 local crew in each city. ^ Field later said, "For us, America was the goal. It sounds like a cliché, but performing in America was everything we ever wanted to do." ^ According to Anthony Field, The Wiggles had to leave their own dinosaur character Dorothy behind, stating tongue in cheek, "Too many dinosaurs on stage can be distracting". ^ The group performed 12 sold-out shows at Madison Square Garden in 2003, and have appeared in the Macy's Thanksgiving Day Parade, the first time in 2001. 1 November 2003 was declared "Wiggles Day" in New York City. ^ By 2011, the group's 20th anniversary, they were performing 350–400 shows a year. ^ Future members Sam Moran hosted and Lachlan Gillespie and Emma Watkins performed in these productions. ^ The New York Times stated that Page's retirement was similar to John Lennon or Paul McCartney quitting The Beatles. ^ One of these performers was Watkins, who appeared along with her sister as an audience member in The Wiggles' first live DVD, Wiggledance!, which was released in 1997. ^ Wilcher never had a signature colour as he left the group before they adopted coloured shirts. ^ Warren has been a consultant for The Wiggles since Field, Cook, and Page were her students at Macquarie University. ^ a b c d Cuneo, Clementine; Duck, Siobhan (18 May 2012). "The great skivvy handover – Emma Watkins will be the first female Wiggle". Daily Telegraph. Retrieved 20 March 2015. ^ a b c d e f g h i j k l m n o p Scott, Paul (2 April 2006). "Kid Rock". The New York Times. Retrieved 30 April 2015. ^ a b c Stapleton, John (7 June 2008). "Death of little girl gave birth to the Wiggles". The Australian. Retrieved 2 April 2015. ^ Mulligan, Mark. "A Brief History of Nearly Everything BSL (Bang Shang a Lang Website)". Archived from the original (DOC) on 20 March 2012. Retrieved 2 April 2015. ^ a b c d e f g h i j k l m n o p Eng, Dinah (23 January 2010). "How The Wiggles became an empire". CNNMoney.com. Retrieved 2 April 2015. ^ a b c d Denton, Andrew (23 June 2003). "Enough Rope with Andrew Denton". ABC.net. Archived from the original on 14 December 2014. Retrieved 2 May 2015. ^ A. Field, p. 44. ^ a b c "A life less Wiggly". Sydney Morning Herald. 24 February 2003. Retrieved 23 June 2015. ^ Sams, Christine (1 August 2005). "The Fifth Wiggle speaks out". The Sydney Morning Herald. Retrieved 23 June 2015. ^ a b c d Tabakoff, Jenny (1 October 2002). "Wake up, Aunty!". The Sydney Morning Herald. Retrieved 3 May 2015. ^ a b c d e f g h i j Munro, Catharine (22 May 2005). "The Wiggly way". The Age. Melbourne. Retrieved 11 May 2015. ^ Chamberlain, Adrian (17 April 2008). "The Wiggles: Rock star status with screaming crowds of tots". Canwest News Service. Archived from the original on 11 August 2015. Retrieved 5 March 2015. ^ Fallon, Daniel (3 June 2014). "My life as a Cockroach (not a Wiggle)". The Sydney Morning Herald. Retrieved 11 May 2014. ^ a b c Sams, Christine (19 May 2012). "I'm no dictator, says Blue Wiggle". Sydney Morning Herald. Retrieved 11 May 2015. ^ a b c Meacham, Steve (3 December 2005). "The master of sword play". The Sydney Morning Herald. Retrieved 11 May 2015. ^ a b c d e f Wright, Anders (25 March 2008). "Baby's first rock band". San Diego Citybeat. Retrieved 22 May 2015. ^ a b c d e f Brandle, Lars (11 February 2011). "The Hot Seat: Anthony Field from The Wiggles". Lars Brandle.com. Retrieved 23 July 2011. ^ "Australian Content Box Office: 1998". Australian Film Commission. Retrieved 22 August 2015. ^ a b c Hoffman, Ken (25 July 2012). "Original Wiggles bring farewell tour to Houston". The Houston Chronicle. Houston, Texas. Retrieved 20 June 2015. ^ a b c d Overington, Caroline (3 November 2003). "They're off to see the Wiggles, the wonderful Wiggles of Oz". The Sydney Morning Herald. Fairfax Media. Archived from the original on 29 October 2015. Retrieved 13 May 2015. ^ "The Wiggles Join Playhouse Disney Monday, June 17" (Press release). Disney Channel. 12 June 2002. Retrieved 13 May 2012. ^ Meacham, Steve (15 December 2006). "First Dorothy, then another yellow road". The Sydney Morning Herald. Retrieved 13 May 2015. ^ Roland, David (1 September 2014). "The Wiggles' Show is 'Packed with High Energy Dancing and Singing'". Broward-Palm Beach New Times. Hollywood, Florida. Retrieved 13 May 2015. ^ Sams, Christine. "Emma Watkins may be known as the Yellow Wiggle but she also has a hip side". The Daily Telegraph. Retrieved 31 May 2015. ^ a b c d e f g Quinn, Karl (19 May 2012). "Wiggle room: the brand played on". The Age. Retrieved 27 May 2015. ^ a b "The Wiggles' lead vocalist to stop performing". MSNBC. Associated Press. 30 November 2006. Retrieved 14 March 2015. ^ a b c Steinberg, Jacques (4 December 2006). "Hush, Mama, Don't You Cry, a New Yellow Wiggle Will Sing". The New York Times. Retrieved 14 March 2015. ^ a b c d e Washington, Stuart; Erik Jensen; Glenda Kwek (21 January 2012). "Yellow sub: Greg resurfaces". The Sydney Morning Herald. Retrieved 20 May 2012. ^ a b c Markstrom, Serena (21 March 2008). "Fab Four of Kid Rock Comes to Town". The Register-Guard. Eugene, Oregon. Retrieved 22 May 2015. ^ McElhiney, Brian (3 November 2009). "Plenty of Wiggle room". The Daily Gazette. Schenectady, New York. Retrieved 1 June 2015. ^ a b c Kwek, Glenda (19 January 2012). "How 'salaried' Sam lost his Wiggle". The Sydney Morning Herald. Retrieved 18 May 2015. ^ Williams, David E (10 October 2006). "Wiggling on without Greg". CNN. Retrieved 22 May 2015. ^ "Wiggles Donate Early Tapes to Archive". Herald Sun. 19 December 2007. ^ a b Zuel, Bernard (15 December 2007). "Welcome to Wiggles World". The Sydney Morning Herald. Retrieved 23 May 2015. ^ Perry, Byron (4 March 2008). "Six Flags to build in Arab world". Variety. Retrieved 23 May 2015. ^ Murphy, Damien (27 April 2009). "Wake up Wiggles: fans see red over website". Sydney Morning Herald. Retrieved 23 May 2015. ^ Gibbons, Kent (20 May 2009). "The Wiggles Move To Sprout From Disney". Multichannel News. Retrieved 23 May 2015. ^ "Wiggle Jeff Fatt has a tricky ticker". The Daily Telegraph. 20 September 2009. Retrieved 20 May 2012. ^ "Purple Wiggle Jeff Fatt undergoes surgery to fix broken heart". Herald Sun. 2 July 2011. Retrieved 23 May 2015. ^ a b "Exhausted Wiggles quit Carols". ABC News. 12 December 2011. Retrieved 23 May 2015. ^ Elser, Daniela (23 September 2011). "Wake up Jeff: Wiggles mark 20th anniversary with Powerhouse Museum exhibition". News.com.au. Retrieved 9 June 2015. ^ a b Washington, Stuart (21 January 2012). "Red ink a hot potato for the wobbly Wiggles". The Sydney Morning Herald. Retrieved 9 June 2015. ^ a b "Meet the new Wiggles!". 702 ABC Sydney. 21 November 2012. Retrieved 10 February 2017. ^ a b c Greg Page Remembers...or Tries To! (Part 11) (Video). YouTube. July 23, 2018. Event occurs at 18:13. Retrieved July 31, 2018. ^ Bleby, Michael (7 June 2012). "Have The Wiggles killed their brand?". Business Review Weekly. Retrieved 19 May 2015. ^ Lindhe, Jane (12 December 2015). "The 50 biggest earners in show business". Business Review Weekly. Retrieved 28 May 2015. ^ Fisher, Ella (5 December 2012). "Wiggles prove their appeal with farewell concert". The Canberra News. Retrieved 28 May 2015. ^ "Wiggles woo Carols crowd". The Sydney Morning Herald. Australian AP. 23 December 2012. Retrieved 28 May 2015. ^ Blake, Jason (24 December 2012). "Wiggles finale upsetting only for the big kids". The Sydney Morning Herald. Retrieved 28 May 2015. ^ Lee, Felicia R (18 November 2012). "The Wiggles Come to Satellite Radio". The New York Times. Retrieved 29 May 2015. ^ "The Wiggles auction off famous Big Red Car for charity". AAP. 18 December 2012. Retrieved 5 June 2015. ^ a b Northover, Kylie (30 November 2015). "Actor and singer Simon Pryce settles into new role as Red Wiggle". The Sydney Morning Herald. Retrieved 31 May 2015. ^ MacDougall, Adam (13 February 2016). "MadFit: The Wiggles' Simon Pryce doesn't kid around when it comes to fitness". The Sydney Morning Herald. Retrieved 14 February 2016. ^ a b McCabe, Kathy (26 August 2013). "The Wiggles dream of playing Glastonbury as they return to Aussie TV and arenas". News.com.au. Retrieved 30 May 2015. ^ Spangler, Todd (4 March 2015). "Hulu Gets 'The Wiggles' in Another Exclusive Kidvid Pact". Variety. Retrieved 31 May 2015. ^ a b McCabe, Kathy (1 June 2014). "The Wiggles are back with a Big Show! tour, and a popular Yellow Wiggle in Emma Watkins". News Corp Australia. Retrieved 2 June 2015. ^ Sachs, Ethan (21 September 2015). "Wiggles room: 24 years into their career, Australian kids band is still going strong". The Daily News. Retrieved 31 May 2015. ^ "Mr Wardrobe: David Campbell are all white with The Wiggles". The Daily Telegraph. 23 February 2015. Retrieved 31 May 2015. ^ Sams, Christine (12 November 2014). "The Wiggles set to make a film set in China co-written with Ben Elton". Daily Telegraph. Retrieved 31 May 2015. ^ Ward, Mary (5 May 2015). "Purple Wiggle to marry Yellow Wiggle after weekend proposal". The Sydney Morning Herald. Retrieved 31 May 2015. ^ Domjen, Briana (9 April 2016). "Purple Wiggle Lachlan Gillespie and Yellow Wiggle Emma Watkins tie the knot in royal-inspired wedding". The Daily Telegraph. Retrieved 11 April 2016. ^ Genevieve Rota (3 August 2018). "The Wiggles' Emma and Lachy split after two years of marriage". The Sydney Morning Herald. Retrieved 4 August 2018. ^ Bucklow, Andrew (20 January 2016). "Anthony Field: The blue Wiggle reveals his favourite celebrity encounter". Australian News.com. Retrieved 9 February 2016. ^ Longhetti, Chloe-Lee (21 January 2016). "Exclusive: 'He'll lead us in!' The Wiggles' Emma Watkins reveals Anthony Field will play bagpipes at her and Lachy Gillespie's wedding... and goats will attend". Daily Mail Australia. Retrieved 9 February 2016. ^ Domien, Briana (3 December 2015). "Wiggles for adults: Original line-up to revs up the Big Red Car for over-18s charity gig next February". The Daily Telegraph. Retrieved 9 February 2016. ^ Dickson, Jeremy (27 September 2017). "With Canada on the map, The Wiggles talk touring tactics". Kidscreen. Brunico Communications Ltd. Retrieved 28 September 2017. ^ "INTRODUCING, THE LITTLE WIGGLES!". The Bugg Report. Bugg Marketing Solutions. 22 January 2019. Retrieved 26 January 2019. ^ a b Bourgeau, Michel. "Play your guitar with Murray". bangshangalang.com. Archived from the original (DOC) on 15 October 2013. Retrieved 23 June 2015. ^ McElhiney, Brian (3 November 2009). "Plenty of Wiggle room". The Daily Gazette. Schenectady, New York. Retrieved 11 June 2015. ^ a b Kretowicz, Ewa (10 November 2013). "Wiggly woman: Emma Watkins' rise to yellow stardom". The Canberra Times. Retrieved 13 June 2015. ^ a b c Sachs, Rob (18 May 2006). "The Wiggles Rock! (Just Ask Your Kids)". NPR. Retrieved 13 June 2015. ^ Durden, Douglas (5 August 2007). "A new face". Richmond Times-Dispatch. Retrieved 13 June 2015. ^ Pollard, Lawrence (19 June 2015). "Entering the world of the Wiggles". BBC News. Retrieved 13 June 2015. ^ Northover, Kylie. "The Wiggles review: Toddlers show the grown-ups how to party". The Sydney Morning Herald. Retrieved 14 December 2014. ^ Murphy, Shane (15 August 2013). "Three new Wiggles are part of children's group tour". Cape Cod Times. Hyannis, Massachusetts. Retrieved 14 June 2015. ^ "Offspring put the wiggle in the Wiggles". The Canadian Press. 8 March 2008. Archived from the original on 10 August 2011. Retrieved 23 June 2015. ^ Elliott, Tim (13 January 2007). "It's a wiggly, wiggly world". Sydney Morning Herald. Retrieved 23 June 2015. ^ "AC/DC tops BRW entertainment rich list, ahead of Kylie Minogue and the Wiggles". Herald Sun. 4 November 2009. Retrieved 24 March 2015. ^ Tabakoff, Nick (21 January 2012). "Wiggles turn a new page after departure of Sam Moran". Daily Telegraph. Retrieved 17 June 2015. ^ MacDonald, Brady (25 November 2010). "Six Flags amusement parks prepare for thematic makeovers". Daily Telegraph. Retrieved 17 June 2015. ^ "The Wiggles embark on Celebration world tour and unveil plans for a new generation" (PDF) (Press release). The Wiggles. 12 May 2012. Retrieved 20 June 2015. ^ Doherty, Megan (27 November 2012). "Wiggling it one last time". The Canberrra Times. Retrieved 21 June 2015. ^ a b c "Hot potato for Wiggles tickets". The Daily Telegraph. 14 April 2008. Retrieved 22 June 2015. ^ a b Sams, Christine (6 April 2006). "Wiggles four degrees hotter". Newsday. Retrieved 23 June 2015. ^ Fraser, Jane E. (20 September 2009). "The Wiggles go to the top of the class". The Sydney Morning Herald. Retrieved 22 June 2015. ^ "One-off Wiggles concert raises funds for UNICEF". The Age. AAP. 26 May 2008. Retrieved 22 June 2015. ^ "Wiggles 'floored' by Australia Day Honours". ABC News. 26 January 2010. Retrieved 23 June 2015. ^ "Wiggles visit sick children at Christmas". Nine News. Australian AP. 26 December 2008. Retrieved 23 June 2015. ^ "Rewiggled – A Tribute To The Wiggles". ABC Music. Retrieved 23 June 2015. ^ "1994 APRA Music Award Winners". APRA. Retrieved 21 June 2015. ^ "1995 APRA Music Award Winners". APRA. Retrieved 21 June 2015. ^ "1996 APRA Music Award Winners". APRA. Retrieved 21 June 2015. ^ "Most Performed Children's Work". APRA. Retrieved 21 June 2015. ^ "Best Music for Children's Television". APRA. Archived from the original on 22 June 2015. Retrieved 21 June 2015. ^ "International Achievement Award". APRA. Retrieved 21 June 2015. Search Results 'The Wiggles': "Winners by Year: Search Results for 'The Wiggles'". Australian Recording Industry Association (ARIA). Retrieved 12 October 2018. 2017 winners and nominees: "Winners By Year 2017". Australian Recording Industry Association (ARIA). Retrieved 12 October 2018. 2018 nominees: "Nominees 2018". Australian Recording Industry Association (ARIA). Retrieved 12 October 2018. ^ "History". Australian Recording Industry Association. Retrieved 22 June 2015. ^ "Delta wins seven ARIAs; Powderfinger takes Album of Year". ABC News. 21 October 2003. Retrieved 22 June 2015. Field, Anthony & Greg Truman (2012). How I Got My Wiggle Back: A Memoir of Healing. Hoboken, New Jersey: John Wiley & Sons. ISBN 978-1-118-01933-7. Field, Paul (8 November 2006). "It’s a Wiggly Wiggly World" (PDF), pp. 1–7. Currency House. Retrieved 1 May 2015. McFarlane, Ian. The Encyclopedia of Australian Rock and Pop. "The Cockroaches", pp. 128–129. "The Resurgence of The Wiggles" (Paul Field interview) (PDF), pp. 55–57. OneDrive.com. Retrieved 30 May 2015. Wikimedia Commons has media related to The Wiggles.